Illustrated Guide to Selling on Instagram & Instagram Shopping | Easy! You may have heard of selling on Instagram with Instagram shopping, but you might not know what it is, or how it works. Ecwid eCommerce makes selling on Instagram super easy. This illustrated guide will show you how to sell on Instagram with Ecwid. Instagram Shopping is a marketing tool that allows you to sell on Instagram. Ecwid is an online store builder that is integrated with Instagram Shopping. This allows you to connect your eComerce to Instagram so you can tag products in posts, and in stories. This article not only demonstrates how to setup Instagram Shopping but you will also learn how to create a Facebook Store. 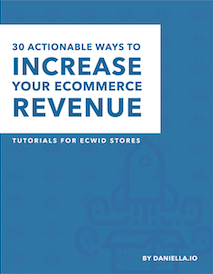 This is a mandatory step in creating your Instagram Shop with Ecwid eCommerce. Therefore these platforms are goldmines of traffic and attention, and connecting your online store to these platform represents a huge business opportunity. Facebook stores have existed for a couple years now so it’s not really a new feature. However Instagram shoppable posts is fairly new and represent a huge business opportunity if you’re not using them yet. Since so few businesses are using Instagram shopping you can have a huge competitive advantage if you start offering your products within Instagram. There are tons of cool features! You can tag products in posts, and in stories and I’m going to talk about that at the end of this article. I’m going to show you how to set everything up first, and I’m gonna give you all the information you need before you get started. So before you get started I’d like to invite you to head over to ecwid.com and sign up to create an account. This will allow you to do is create your online store quickly and easily. You’ll then be able to connect it to your Facebook account and to your Instagram account. You can also use this as a website if you don’t sell online yet if you already sell online. If you’re frustrated with your current ecommerce solution you’ll be able to add your Ecwid store to your current website. I really believe it’s the best thing for you if you’re a small business owner if you’re a marketer if you’re a creative. If you’d like to learn how to set up your Ecwid store really quickly I have a video that shows how to set up your Ecwid store in five minutes. So the first thing I’m going to show you how to do is set up your Facebook store. Now there are a couple important things that you’ll need to know before we get started. First of all, in order to activate the Facebook store feature you will need to have a paid Ecwid account. So you’ll have to upgrade to a paid account to be able to use the Facebook feature. The second thing is you might want to have a good look at the Facebook merchant terms and conditions and there’s one thing in there that concern a couple of us is downloadable goods. You are not allowed to sell anything that is not a physical product so if you have these products to sell online you won’t be able to add them to your Facebook store. The last thing I wanted to point out before we have a look at how to do the integration is the fact that it may take a while for you to be approved by Facebook. So it can take up to 48 hours it depends on how fast they’re gonna process your request. You will have to be patient, but once your store is approved all your products, or part of your products, depending on what is approved, or not by Facebook, will be pushed to your Facebook store page. It only takes a couple minutes to open your omni-channel facebook store and start selling on tablets and mobile phones through your facebook business page. Each and every sale will be synced to your Ecwid control panel reach more customers and allow them to shop through your facebook business page. Your Ecwid store will then sync to a new Facebook tab. Your store is now connected to Facebook. Click on “visit Facebook shop” and check out your new Facebook shop. It’s as easy as that to get selling on Facebook with ecwid now you can sell your products on your facebook business page not only on desktop but also on mobile and tablets. Subscribe button: it can notify your store subscribers them when you add products to your online store. I think that’s one of the most powerful features that are available right now with the Facebook integration because people are constantly looking at their Facebook notifications and if you can easily push notifications to your customers by them just clicking on that subscribe button. Tag products in your photos when posting to your Facebook feed. The embedded product link will send your customers directly to your product in your store if they click on it. You could also share your product catalog by clicking on the share collection button. Share individual products on Facebook from within your shop by clicking on the share button. Awesome, once your Facebook store is set up you’ll be able to connect your Instagram account and start selling on Instagram. Ecwid makes selling on Instagram super easy. You’re actually going to need to use the Facebook integration to be able to use the Instagram integration. Now there will also be an approval time for Instagram shopping. Another thing you might want to know before you begin, you will have to have an Instagram business account. So go into your settings and check out business profile and make sure that your accountis a business account before you begin this process. You can sell your products on Instagram by tagging them in posts that feature your products. You can now tag your products directly on your Instagram feed, as well as on your posts, and on stories, so customers can click a link to purchase them in your online store. Your instant Instagram shop is available in 44 countries and only takes a couple minutes to set up. Tag products in posts: Tap the products in the photo you want to tag and simply select the products you’d like to sell. You can take up to five products per single image post or 20 products per carousel post. You don’t even have to create new posts because you can add text to existing posts by editing them. This is an excellent opportunity if you’d like to go back to your best posts and make them shoppable. Educate: Once again you’re gonna have to inform your customers about these features, and one way that I suggest doing that is writing it in the description so you could put a little emoji with a finger that’s like pointing or clicking and you can say shoppable post or you know click on the post to see the products in the store you’re gonna have to like educate a little bit because these are new features at this point. Of course, for now it’s still a fairly new feature not very many users know that you can actually shop on Instagram it’s becoming more and more popular but you will have to tell your customers in the post that it is actionable and that they can click on it and purchase your products. Go back over your old posts and find the most popular ones and then go make them actionable because if they’re your most popular posts. Customers will be able to purchase your products that are within those posts. And my last piece of advice would be to go to your messages and if there using Instagram really well you probably already have template messages that you send out to new followers. Link to your Instagram products within your messages that you’re sending to your customers. #5. 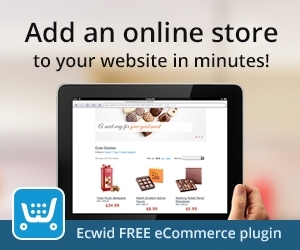 Take Your Ecwid Store to the Next Level! I hope you are as enthusiastic as I am about these awesome features! 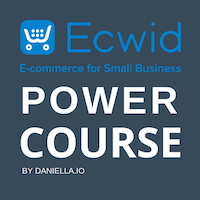 If you’d like to learn more about how to use ecwid and set it up check out my Ecwid eCommerce Power Course. It contains everything you need to know about selling in multiple places, online building your online store and generating targeted traffic starting day one.